A marine mammalogist is a scientist who specializes in the study of marine mammals. There are over 100 species of marine mammals including pinnipeds (seals, sea lions, and walrus), cetaceans (whales, dolphins, and porpoises), sirenians (manatees and dugongs), and some carnivores, such as sea otters and polar bears. Marine mammalogy is a diverse field that often includes the study of animal behavior, communication, evolution, physiology, ecology, and zoology. Marine mammalogists may study the genetics, evolutionary relationships, population structure, community dynamics, anatomy and physiology, behavior and sensory abilities, parasites and disease, geographic distributions, ecological interactions, management and/or conservation of marine mammal species. Like zoologists, many work to increase the knowledge and understanding of wildlife species. They often conduct field research to learn about the behavior and interactions of marine mammals in their natural environment. Marine mammalogists may specialize in the study of particular groups of species. For example, because there are such large differences between taxa, they may specialize in the study of pinnipeds, or odontocetes, or mysticetes. Alternatively, some scientists specialize in the study of animals that may share a common environment, such as Arctic species. Tracking and monitoring marine mammals to investigate habitat, interactions, predator-prey relationships, reproduction, foraging, and/or migration behaviors, fisheries interactions, etc. Because marine mammals are found worldwide, the ability to speak in a foreign language may also be helpful, especially if work is conducted in other countries. Bioacoustics is an interdisciplinary science focusing on sound production and reception in animals, how sounds are used by different species, and how sound can be used to detect and localize animals. This field of study can include researching how animals produce sound; how ears sense sounds; and the role that sound plays in communication between individuals. Studies may also focus on the impact of anthropogenicsound on marine mammals, what sounds may cause injury or tissue damage, and the ways in which sounds may disrupt a species’ normal activities. Each marine mammal species produces distinctive sound such as echolocation clicks, calls, or songs. Sounds may be used for communication, feeding, and/or navigation . Marine mammalogists can listen to and study marine mammal sounds, identify species, estimate abundance, document distribution and make potential correlations to behavior, all of which provide valuable information to resource managers overseeing natural resource policies on the marine environment. Marine mammal bioacoustics work includes the use of underwater acoustic tools such as hydrophones, hydrophone arrays, and other passive acoustics sensors to detect and monitor the presence of marine animals, the sounds they make, and the potential effects of anthropogenic noise. Hydrophone arrays can be used to detect and calculate the position of a marine mammal producing sound. A hydrophone array consists of three or more hydrophones deployed at different locations. Researchers also use archival passive listening systems also called Marine Autonomous Recording Units (ARUs) , or “pop-up” buoys, which record underwater sound and can be used to evaluate the presence of marine mammals in an area. Passive acoustic recording tags help overcome many of the limitations experienced with visual surveys. They have been incorporated into survey methods to improve animal abundance estimates, especially for cetacean surveys. Passive acoustic recording tags, such as the “D-tag”, developed by the Woods Hole Oceanographic Institution, have allowed scientists to measure the acoustic environment in tandem with behavioral information for the tagged animal. The tag records not only the sounds of a tagged whale, but all other sounds from various sound sources in the area such as boats (even distant ships) and other whales. D-tags have been used to study many marine mammals such as humpback whales , North Atlantic Right Whales , sperm whales , pilot whales , blue whales , gray whales, , Blainville’s beaked whales and Cuvier’s beaked whales, as well as fur seals. 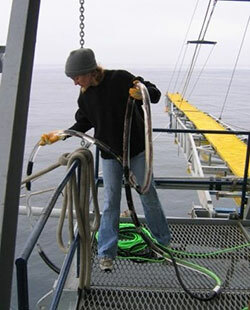 Elizabeth Henderson has been conducting behavioral and acoustic studies of marine mammals for over 15 years. She has worked primarily in the field with wild populations of a variety of cetacean and pinniped species, but has conducted lab-based research with captive animals as well. Her primary interests are behavioral ecology, bioacoustics, and the impact of noise on the behavior and habitat use patterns of marine mammals. She received her Master’s degree from Texas A&M University, and her PhD from Scripps Institution of Oceanography at UCSD. 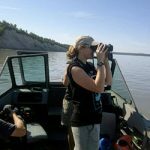 She currently works with the National Marine Mammal Foundation as a Marine Bioacoustic Specialist, where she conducts research on the impact of anthropogenic noise on marine mammals and applies this knowledge to environmental compliance documents for the U.S. Navy. Sound Production > How do marine mammal produce sound? Sound Reception > How do marine mammals hear? Investigate Marine Mammals> How is sound used to study marine mammal distribution? Investigate Marine Mammals> How is sound used to estimate marine mammal abundance? Investigate Marine Mammals> How is sound used to protect marine mammals?